what to use for these file management situations? hi, i've been looking to have data use on different mediums, and i haven't really found the results yet. is there any advice or recommendations i can be given? i'm looking to archive under 64 gb of memory so i thought a thumbdrive could take that and be stored away somewhere. what i mean by archive is to rarely view these files and maybe put something on it that i could've forgotten. i was told to use hdds and multiple backups, but that's not an affordable solution for under 64 gb. then i'm looking for a 8 or 16gb solution to typical plugging and unplugging and file transfers. i think a regular thumbdrive would work, but i don't know which one. 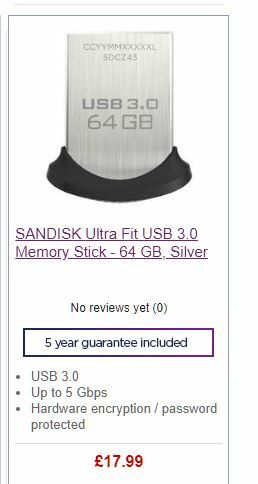 i've planned to buy a small sandisk plug-and-stay thumbdrive for work files i need constant access to and i think this is the only one of three i know to buy. so, what can you recommend? Just because it fits doesn't mean it works. Re: what to use for these file management situations? The Sandisk plug-and-stay thumbdrive is a great choice for storage which stays on a laptop or desktop. The main problems i see with pen drives are Broken connectors, worn out connectors , damage due incorrect removal, and general failures of the memory. All bar the last is covered by the small rugged size of the plug and stay drive. Something to consider is thumb drives are for transferring data not as a replacement for storage like hard drives. So if you want to use for storage best to keep other copies in 2 other places say another pen drive and the cloud. thanks, lisa. this archive is personal so i would prefer it off the cloud, but if it works, i'm ok with keeping the data on two different thumbdrives. hdds for under 64 gb seems like too much. while we agree the plug-and-stay is good for work files, i still do not know what would be recommended to keep that archive on. i do though also believe a regular sandisk could be used for the frequently transferring case, like a 16 gb sandisk ultra cz48. so still one of three solved. You are over thinking this. USB flash drives are a commodity product. Just buy the size you can afford, and choose a good brand. Sandisk are good, so are Toshiba, Kingston. They are all "plug and play", so I'm not sure what you mean by this. if you are worried about data loss, buy 2, of different brands, and put your data on each one. They are all "plug and play", so I'm not sure what you mean by this. plug-and-stay is what sandisk advertise some of their physically small thumbdrives as. it supposedly means not for frequent plugging and unplugging use. so while i believe i have found one for transferring and one to stay in, i'll search for what to put this specific data on, but i'd still like recommendations. Sorry, I read your question wrongly. The idea is that it is so very small that you can, if you want, plug it into a USB port and just forget about it, and use it as extra storage, especially if you use a USB 3 port if you have one. The 'plug and stay' thing is just Sandisk marketing. All USB thumb drives are plug-and-stay if you want them to be. I have had a normal length one inserted into a USB 3 port at the back of my computer for about 2 years with various rescue things on it, that I can boot from if I need to. I suppose one advantage of a very short and stubby thumb drive is that it might be harder to damage the connector or the port by bending or knocking it accidentally. My feeling is that if you want extra USB storage, a 1 TB external drive, powered by the USB port, does not cost very much more than two 64 GB thumb drives. using "safely remove hardware" is great and safe, i do it, but it's not magic that prevents data loss forever, and i'd still want hardware that isn't only dependent on safely removing it. My feeling is that if you want extra USB storage, a 1 TB external drive, powered by the USB port, does not cost very much more than two 64 GB thumb drives. this is true, but it's not what i'm looking for. i have no use for the other 950 gb. i'm only looking to store these files somewhere else and use the other thumbdrives. more directly, does it matter if this data is stored on two ultra fits or not? the newer model of it is cheaper, and i found two different brand normal lengths i can store it on, as you told me about yours. so if it doesn't matter, i'm going for the cheapest option here. i'd still want hardware that isn't only dependent on safely removing it. You will be looking for a very long time. i have no use for the other 950 gb. No, it's magic that forces the OS to flush all pending writes. It cannot protect against the other ills that flash memory is heir to. A diverse approach is best. One flash drive, one SSD in an enclosure, or an external one... the cloud... a NAS, get a BD-R burner... have fun! No, it's magic that forces the OS to flush all pending writes. It cannot protect against the other ills that flash memory is heir to.